Image information: This work is in the public domain in the United States because it is a work prepared by an officer or employee of the United States Government as part of that person’s official duties under the terms of Title 17, Chapter 1, Section 105 of the US Code. The nine justices of the Supreme Court of the United States following the addition of Neil Gorsuch in April 2017, who replaced Antonin Scalia (died in office, February 2016). 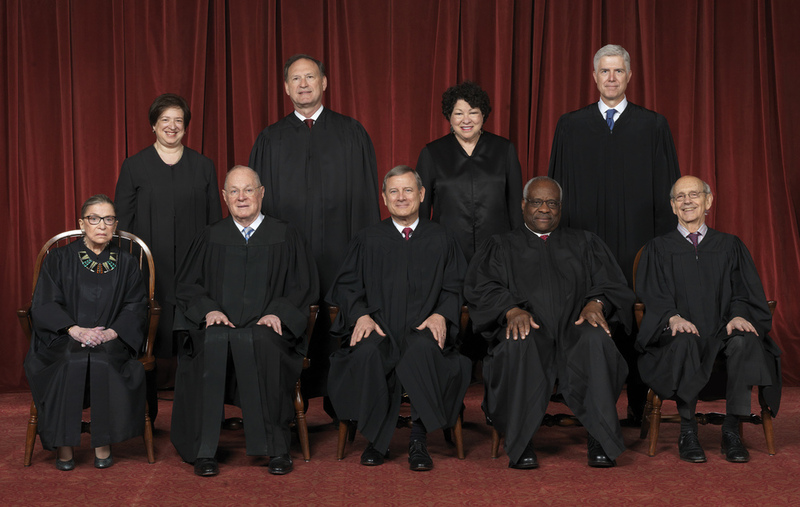 Seated (front), from left to right: Justices Ruth Bader Ginsburg and Anthony M. Kennedy, Chief Justice John G. Roberts, Jr., and Justices Clarence Thomas and Stephen G. Breyer. Standing (rear), from left to right: Justices Elena Kagan, Samuel A. Alito, Sonia Sotomayor, and Neil M. Gorsuch.